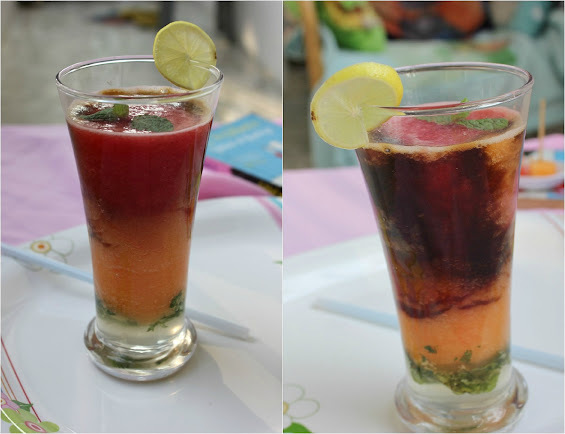 Liquid Friday: Melon"y" Sizzlers by 'Priya Sreeram' - Simply Fahad-istic! "When I stand before God at the end of my life,I would hope that I would not have a single bit of talent left,and could say,'I used everything you gave me.'" A beautiful talent quote!Because 'Talent',is the first word that appears in my mind when I think of Priya Sreeram,the Blogger behind Bon Appetit( http://eq-myblog.blogspot.in ) !To me,(and I hope,to you too!) talented Food Bloggers are not those who merely have a bunch of pretty pictures - the pictures are of course important,but need to be accompanied with meaningful,captivating words and most importantly,mind blowing recipes. For a Food Blogger who is as aware of Spanish cuisine(Yeah,I am trying her Churros tomorrow!) as of regional Indian fare(I tried her Urulai Thirattal ,a Tamil preparation sometime back - a delicious potato curry with South Indian flavors!) 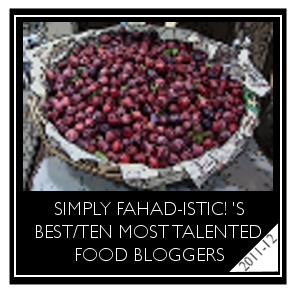 ,Priya obviously had to be on this Best/Ten Most Talented Food Bloggers list!Oh,and did I mention,her Charred Aubergine & Cottage Cheese In A White Gravy is on my 'To Cook' list?I know,I can go on talking about her neat blog,so before this turns into an essay,take over,Priya! Fruits, the delicious nature's bounty is a joy to dig in to. Dressed in rainbow colors and power packed with essential minerals, vitamins and nutrients; what is not to like about them? Plus most fruits are low in calories. Need I say more. I often indulge in mindless binging and guess what keeps me company. A bowl full of papayas or watermelons. They refresh the body and bring back the zing. Takes my mind off the unnecessary stress and rejuvenate me with peppy freshness. I so love fruits. Unfortunately my kids don't share the same passion when it comes to gulping them down and I constantly find ways to sneak these wholesome goodness into their diet. Salads, rices or cakes does the trick. But blending them into juices is the surest way of making my kids connect with these wondrous delights. Watermelons and muskmelon are available around the year where I live and are staple ingredients in my hearth. 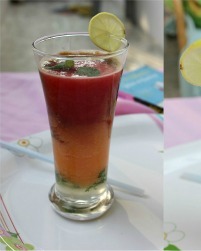 The melons bring a radiant and vibrant touch when mixed into juices. For these recipes, I have used some sugar syrup for a sweet touch. You can use honey or agave nectar to up the health quotient. It is a heady combo of coffee and melons with ginger bringing the heat. I have used the coffee decoction collected from the filter. Being a South Indian I am partial to the filter kaapi and hence this twist to the drink. I guess you can also use Instant coffee powder if you don't have a filter. Prepare the potent coffee decoction first. Add heaped spoons of the coffee powder to the perforated upper cup of the filter, top it with enough boiling water and keep covered. Wait for the decoction to collect in the lower cup. 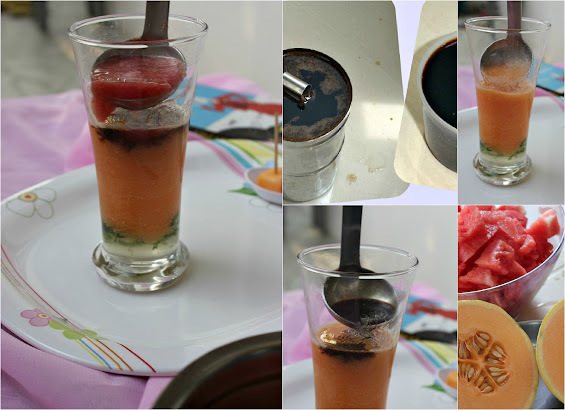 Blend watermelon and muskmelon cubes separately in a blender till fine and keep aside. In a tall glass add the ginger and mint leaves. Muddle (crush) the peeled ginger and mint leaves gently using a pestle. Add the sugar syrup first. Pour the muskmelon/cantaloupe juice gently using a spoon so that the bottom layer is not disturbed. Top it with a big spoon of the coffee decoction similarly. Then add the watermelon juice. Build the juice like that. Garnish with a sprig of Mint and a slice of lemon. This is a spin-off on the Bloody Mary. Watermelon and tomatoes fuses well with the green chili. And what definitely ups the quotient is the salt rimmed glasses from which it is sipped. When I make them for the kids, the green chili is shown the boot and the drink is mellowed down. Blend the watermelon cubes along with the tomatoes and the green chili well. Mix the salt and the pepper powder. 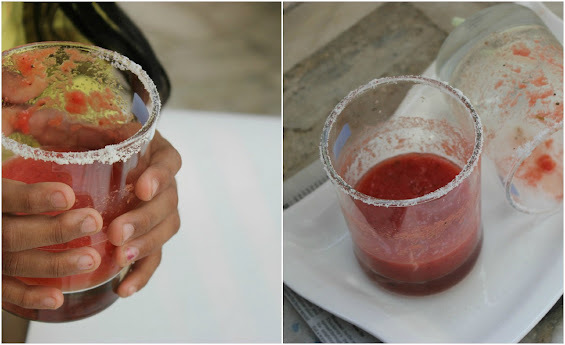 Apply salt to the rims of the glasses and serve the juice with crushed ice. Now this one is my daughter's personal favorite. And why not the cool letter ‘I’ is to be given the credit. Yup, a generous dollop of ice cream adds to the zing. 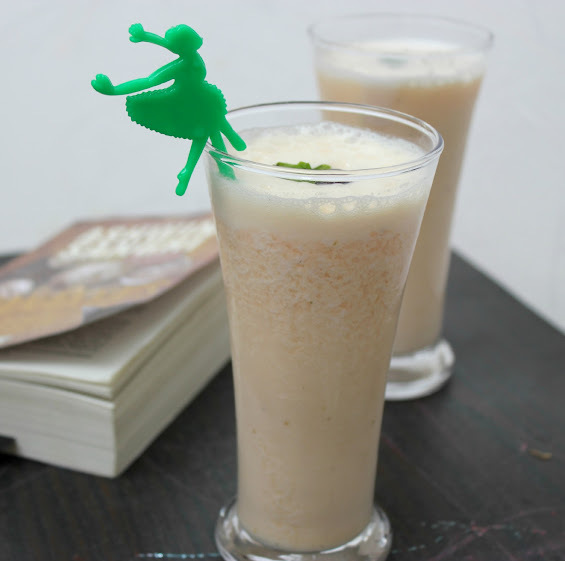 When spiked with dry mango powder and chaat powder, the drink gets a real pep. Perfect for kiddo’s parties too. You can sit back and grin when the glasses are wiped clean.